For crazy adults only: We round up some of the nastiest tabloid offerings of the past week. 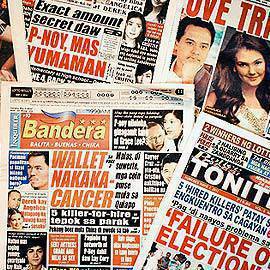 (SPOT.ph) Pinoy tabloids have a way of angling any kind of news in the most salacious way possible. In our third installment of the Tabloid Grab Bag, we came across more interesting and disturbing content from the most popular "sidewalk literature." Image credits: All images are shots from the pages of Hataw!, Remate, Bomba Balita, Bagong Toro, Pinoy Parazzi, Ang Orig Toro, Bulgar, and Abante Tonite.